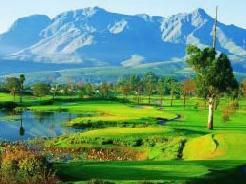 The Links golf course at Fancourt is a highlight in any golfing package in South Africa. Rated No. 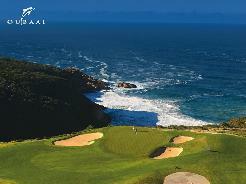 3 in the country, it is without doubt the most impressive piece of golf design and construction ever in South Africa. Fancourt owner Dr Hasso Plattner, who took a very hands-on function in the creation, commissioned Gary Player to build a golf course, which would not only be a thorough test for every golfer, but would also rank among the top courses in the world. Player’s design team spent months studying the classic links courses of Scotland and Ireland and then, armed with inspiration from the best that those countries had to offer, embarked on the ambitious task of recreating some of their finest holes to make a genuine links test on what was once an airfield. 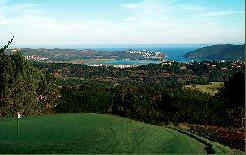 It is a Golf Connoisseur's course. The result is awe-inspiring and has elicited praise from some of the world’s finest golfers – The Links was the host venue for the 2003 Presidents Cup, which ended in an historic tie after a dramatic play-off between Tiger Woods and Ernie Els. In early 2005, it was the host venue for the Women’s World Cup of Golf, which was won by the diminutive duo of Rui Kitada and Ai Miyzato of Japan. In December 2005 The Links hosted the SAA Open, the world’s second-oldest national Open Championship. 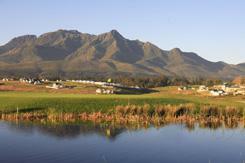 The Links at Fancourt is a private club, with play restricted to members and their invited guests. There are limited times available to guests staying at Fancourt’s hotel – advance booking is essential. 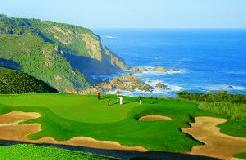 Be forewarned, it is expensive by local standards and this is one tough test of golf - not for the faint hearted! 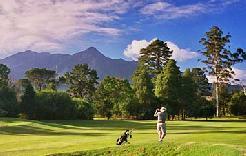 When playing The Links, it is difficult to believe that one is not in Scotland or Ireland, until, that is, one notices the imposing Outeniqua mountain range that rises impressively in the background - not to mention the weather! In a first for South Africa, the tees and fairways are a mix of four cool season grasses: Kentucky Blue, Rye, Fescue and Bent, with the greens a dominant Bent. These grasses allow for the traditional Pitch and Run shot to be played and also for the ball to 'chase' along the fairways. The clubhouse at The Links is located only metres from the 18th green, with terraced areas and picture windows, to take maximum advantage of course and mountain views. All in all there is a very special atmosphere. 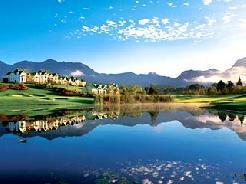 The Fancourt Hotel & Country Club Estate is set on 350 acres of beautiful South African countryside. A combination of old world charm and values, and modern luxuries make Fancourt an ideal holiday or conference venue. Enjoy superb cuisine in one of our four restaurants.